On first glance, liberals and conservatives agree on very little these days, especially now that we find ourselves in the era of Donald Trump. 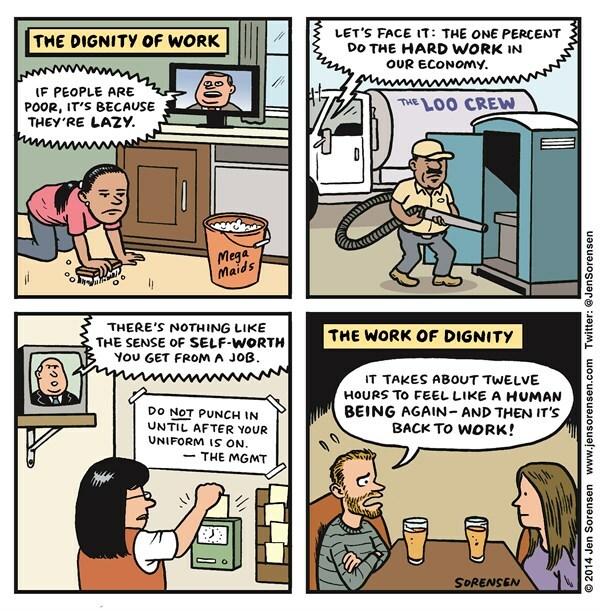 But they do seem to find common ground on one thing: the so-called dignity of labor. Let me explain. In the article I referred to yesterday, conservative Arthur Brooks invokes the “dignity of labor” as the reason anything and everything should be done to stem the fall in the labor-force participation rate of white men and get them back to work. The single most important part of a “neededness agenda” is putting more people to work. It imposes regularity and discipline on people’s lives. It can be a source o mental stimulation. It helps to fulfill the widespread desire to contribute to, and be integrated in, the larger society. It shapes identity and can boost self-­esteem. With neighborhood and family ties weakening, the office or factory can be a key site of social interaction. 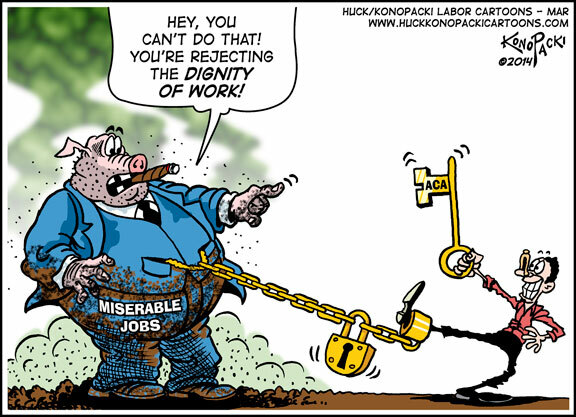 Lack of employment tends to be associated with feelings of social exclusion, discouragement, boredom, and unhappiness. 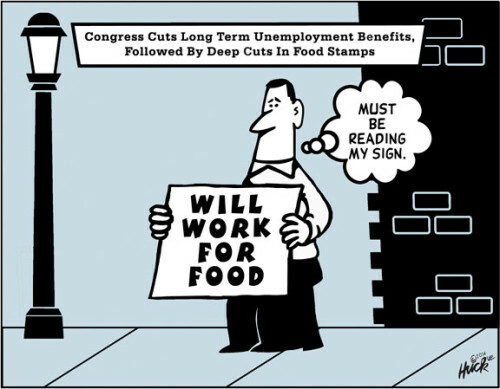 Societies also need a significant majority of people in paid work to help fund government programs. No matter the fundamental differences in the policies they advocate, Brooks and Kenworthy are in fundamental agreement that people should believe in the dignity of work and government policy should be redesigned to make sure people—especially the members of the white working-class—get back to work. I have already dealt numerous times (e.g, here, here, and here) with the argument that participating in wage-labor is intrinsically dignified. But the question remains, why should the government be brought in—in the eyes of by both conservatives and liberals—to make sure people are forced to have the freedom to acquire that dignity? Nietzsche believed that, in the modern world, the so-called dignity of labor was one of the “transparent lies recognizable to every one of deeper insight.” Apparently, neither Brooks nor Kenworthy can count himself among those with such insight. The need for a paycheck can trap people in careers that divert them from more productive or rewarding pursuits. Paid work can be physically or emotionally stressful. It can be monotonous, boring, alienating. Some jobs require a degree of indiference, meanness, or dishonesty toward customers or subordinates that eats away at one’s humanity. And work can interfere with family life. Mainstream economists and economic commentators continue to invoke the so-called “dignity of work” to criticize the idea of a universal basic income. It’s an argument I’ve dealt with before (e.g., here and here). As I see it, there’s nothing necessarily dignified about most people being forced to have the freedom to sell their ability to work to a tiny group of employers. The idea may be intrinsic to capitalism—but that doesn’t mean it contributes to the dignity of people who work for a living, especially when they have no control over how they work or what they produce when they work. these writers dislike the fact that a UBI would deliver individuals income in a way that is divorced from working. Such an income arrangement would, it is argued, lead to meaninglessness, social dysfunction, and resentment. One obvious problem with this analysis is that passive income — income divorced from work — already exists. Bruenig is making a distinction between income related to work and income that comes from other sources—passive or not-work—which represents a fundamental divide within contemporary society. 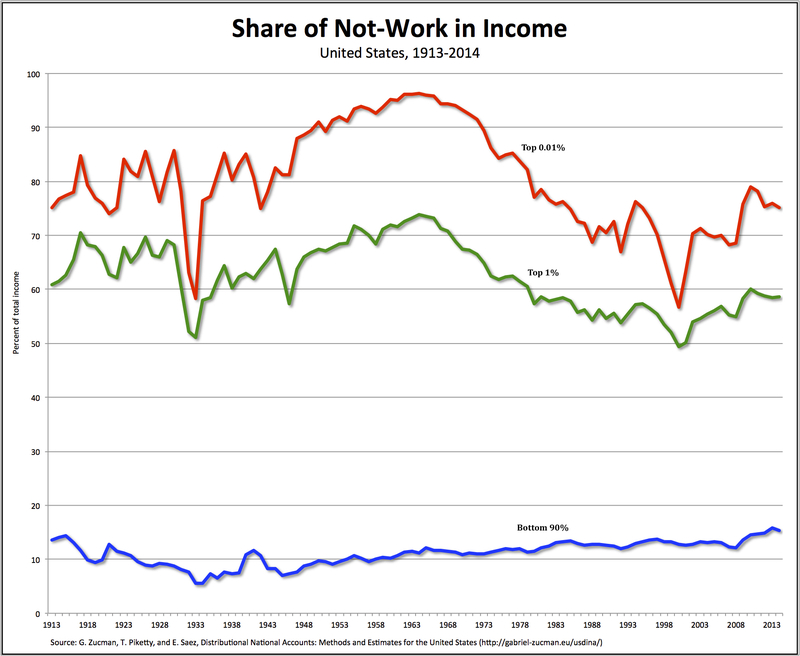 As is clear from the data in the chart above, very little of the income (15 percent in 2014) of the bottom 90 percent of Americans stems from not-work (and, even then, most of their apparently not-work income is actually related to previous work, in the form of pension incomes). However, for the tiny group at the top, most of their income (59 percent for the top 1 percent, 75 percent for the top 0.01 percent) is related to not-working (and, of course, most of their work-related income is based on sole proprietorships and elevated executive salaries). In other words, most of their income represents a claim on the extra work performed by others. *Now, it’s true, as Noah Smith observes, “many rich people believe that investing constitutes work.” But spending a few minutes a day reading the business press and examining alternative investments does not constitute work—at least as most people understand what it means to work. Or are those rich people referring to the fact that they hire a whole host of other people, from financial advisors to accountants, to do the actual work of managing their not-work investments? 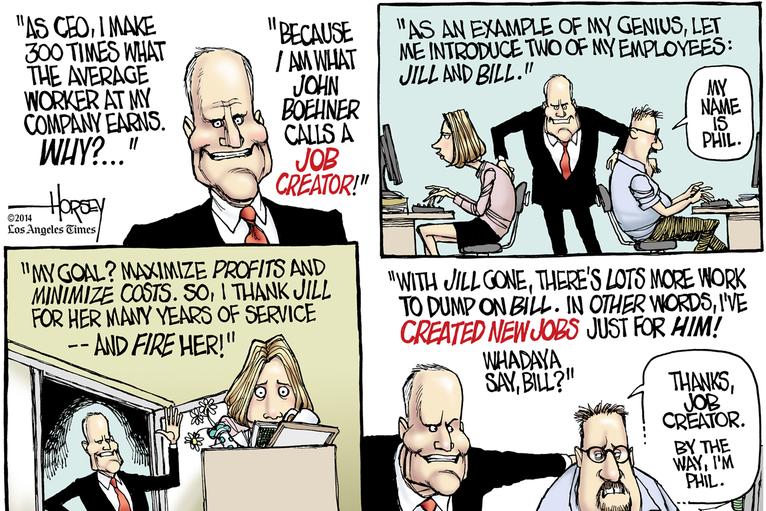 Like the conceptual equivalent of Gresham’s Law, bad ideas about work keep driving out good ones. That’s bad enough. But even worse is that Smith thinks he’s criticizing and improving on mainstream economic theory, according to which “a job isn’t treated as something inherently valuable — it’s just a conduit through which money flows from employer to employee.” So, he recommends mainstream economists look to sociology to affirm the dignity of labor. The problem is, sociology—especially the sociology of work—is not going to give Smith what he wants. A job is, of course, more than “a conduit through which money flows from employer to employee.” That’s just the beginning of the process, the exchange of the ability to work for a wage or salary. That’s already an enormous indignity—to be forced to have the freedom to sell one’s ability to work to a tiny group of employers who have access to the wealth to hire them. And, once the exchange is completed, people have to actually do the job—producing goods or services for their employers, who are able to appropriate the surplus workers create. Thus, in the realm of production, after having sold their ability to perform labor, workers are forced to submit to the control of employers and their hired supervisors, who subject them to whatever conditions are necessary to generate a profit. Otherwise, they wouldn’t be hired in the first place. Whatever it takes: low wages, long hours, unsafe working conditions, little time off, constant surveillance, no say in what is produced or how it’s produced. And the list goes on. And all Smith would have to do is read a little of the sociology of work (e.g., in Philip Hodgkiss’s essay on “The Origins of the Idea and Ideal of Dignity in the Sociology of Work and Employment,” in The SAGE Handbook of the Sociology of Work and Employment)—starting with the “classics” (Marx, Durkheim, and Weber) and continuing with the recent literature (including Harry Braverman, Michael Burawoy, and Arlie Hoschschild). That’s not to say there’s no place for dignity in and around work. When workers band together to form a union and collectively bargain with their employers, they manage to achieve a level of dignity. And when they eliminate discrimination or bargain to expand benefits. They achieve a different kind of dignity when they are able to participate in decision-making or establish their own firms—whether in the form of cooperatives or worker-owned enterprises. So, yes, workers can achieve dignity—not by having jobs (as Smith and other mainstream economists assert) but by struggling over the conditions of those jobs. When they assert and affirm their dignity as human beings, not because of but in spite of the fact that, within current economic institutions, they’re forced to have the freedom to work for someone else. And, even more, when they reject those institutions and become their own bosses. There is general consensus, though originating from many different perspectives, that dignity is an essential core human characteristic. It is overwhelmingly presented as meaning people are worth something as human beings, that it is something that should be respected and not taken advantage of and that the maintenance of human dignity is a core contributor to a stable moral order in society. However, when entering the realms of work and the complexities of exchanging labour for a wage the definitions become much less clear. In selling one’s labour does one also relinquish autonomy, freedom, equality and, often, well-being—the very ingredients of life that have been most commonly associated with human dignity. So, yes, Smith and other mainstream economists might want to spend more time reading in and around the sociology or work. But, once they do, they’re probably not going to experience a great deal of self-worth in relation to their blithe assertions concerning the dignity of work under capitalism. 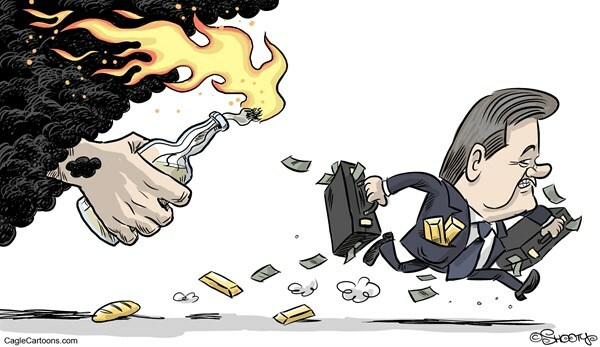 Both Dani Rodrick and Brad DeLong understand that capitalism can’t be let off the hook. Its failures—which take the form of obscene levels of inequality, growing economic insecurity, and so on—are responsible for what they refer to as the “populist backlash” in the United States and Europe. But, instead of exploring alternatives to capitalism, both Rodrick and DeLong hold out hope that something can be done to mitigate those failures, dampen the backlash, and ultimately save capitalism. Rodrick looks to moderate political elites who, in his view, have been unwilling to offer remedies for the failures of capitalism—in contrast to the 1930s. DeLong sides with Rodrick and then invokes Keynes and Karl Polanyi as still the best guides for political economy. For both Keynes and Polanyi, social insurance in the form of progressive taxes, a universal basic income, and government provision of public goods plus private necessities would help, but that would not be enough to do the job. Also essential are: first, useful employment and the resulting honorable and dignified role in society; second, justice in the sense that playing by the rules of the economic game calls forth the expected rewards; and, third, communal stability in the sense that should people’s lives be transformed in place, community, and occupation it is by being pulled out of old ruts by brilliant opportunities locating in other places, living in other communities, and practicing other occupations–not being pushed out by regional or sectoral economic collapse, or perhaps by having one’s community transformed too rapidly around one. Here’s the problem: both Rodrick and DeLong can come up with a list of policies and examples of “radical institutional engineering” that political elites might use to produce more employment and security for capitalism’s victims. But they don’t understand how and why economic elites, the same ones who (along with moderate politicians) promise dignity, justice, and so on, act, now as in the 1930s, have in the normal course of business undermined those lofty promises. That’s the economic side of political economy Rodrick and DeLong ignore. The tiny group at the top that makes the key economic decisions (e.g., members of corporate boards of directors, owners, top executives, and so on) promise dignity but the only dignity they offer is for everyone else to work for them. They promise justice but the only justice they recognize is their own command over appropriating, distributing, and receiving the surplus. The problem is wage slavery. America touts itself as the land of the free, but the number one freedom that you and I have is the freedom to enter into a subservient role in the workplace. Once you exercise this freedom you’ve lost all control over what you do, what is produced, and how it is produced. And in the end, the product doesn’t belong to you. The only way you can avoid bosses and jobs is if you don’t care about making a living. Which leads to the second freedom: the freedom to starve. As long as that economic elite is able to define dignity, justice, and freedom on their own terms—and as long as political elites and mainstream economists accept those definitions, even as they come up with policies and institutions to secure them—we can expect to see other politicians and economists step forward to give voice to the excluded and their rage against the machine. We’ve been over this before but, like a bad penny, it just keeps coming back. . .
Conservatives and liberals seem not to agree about anything these days (as my students often complain). But there is one idea they do share: the wages-system needs to be protected at all costs. 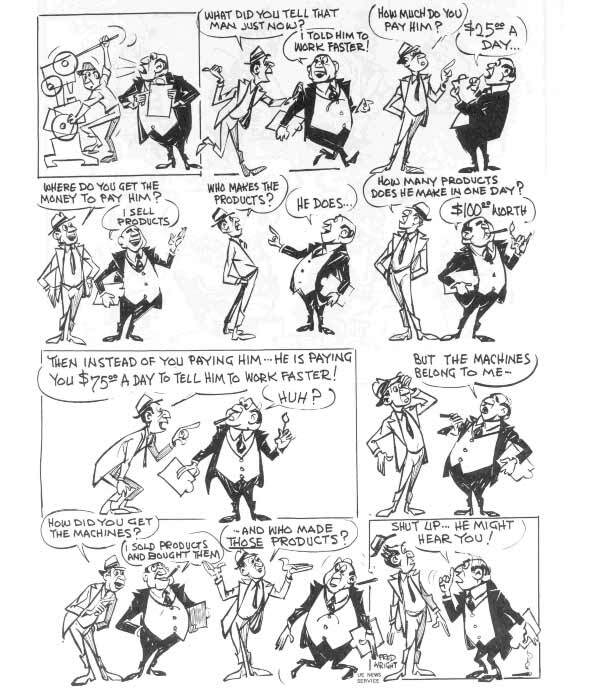 Economists, politicians, and columnists from the two ends of the political spectrum do have different starting points: conservatives believe that workers are at bottom shirkers, and therefore need to be forced off their “dependency” on government programs in order to lower the reward for non-work, while liberals start with the idea that workers today are not being paid enough, at least those at the bottom, and the minimum wage should be raised in order to raise the reward to work. No one should ever endure the kind of economic humiliation that comes with working a full-time job and making a less-than-living wage. There is dignity in all work, but that dignity grows dim when the checks are cashed and the coins are counted and still the bills rise higher than the wages. Most people want to work. It is a basic human desire: to make a way, to provide for one’s self and one’s loved ones, to advance. It is that great hope of tomorrow, better and brighter, in which we can be happy and secure, able to sleep without hunger and wake without worry. But it is easy to see how people can have that hope thrashed out of them, by having to wrestle with the most wrenching of questions: how to make do when you work for less than you can live on? Really? A “basic human desire”? We all warn our students about making such sweeping, universal statements—especially when not a shred of evidence is presented. But the problem here is worse. It’s the presumption that people want to work (instead of being forced to work) and that working is somehow making one’s own way (instead of being dependent on the whims and wishes of private employers). 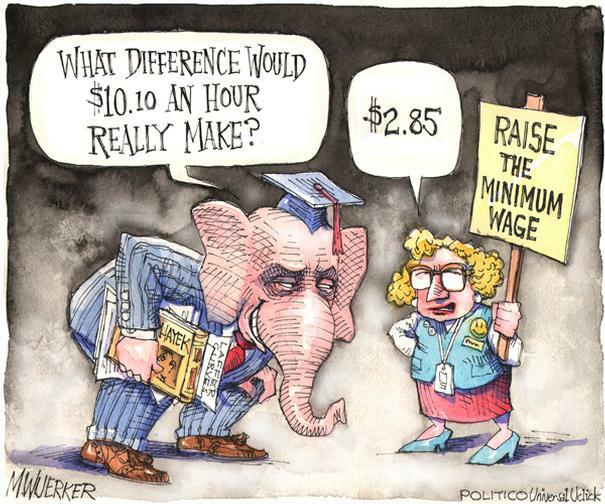 In other words, it’s the same argument conservatives make: everyone wants (and at least should want) to be a worker. Except, of course, for those at the very top, who are dependent on getting a cut of what workers produce.